These words resonates an old Indonesian saying that states that it would always be better to be the king of a small kingdom rather than to be the chief advisor of an empire. There is, definitely a kind of rebellious attitude in the entrepreneur’s spirit that keeps calling for something different and exciting. Other voices from entrepreneurs and from the academic world suggests that entrepreneurship can be taught. This is a prominent promise in the higher education systems today where they try to nurture the entrepreneurship spirit both academically and through extra-curricular activities. What they are trying to offer is the right environment to boost entrepreneurship among their students. These are some reasons that you should take into consideration. Studying in the university would actually train you for some kind of framework and routine. You are to be prepared mentally for structure and organization. You learn that every step requires certain processes and take a particular amount of time in order to be achieved. The term “mahasiswa” in the Indonesian language refers to students studying in the university or higher education. The word is a compound word of maha, meaning super, and siswa which means student. This reflects the mindset that a “mahasiswa” is a “super” student, which should possesses a more critical frame of thinking and a heightened mental durability, contrasting the word “siswa” which is reserved for a student studying in the elementary, middle or high school. Abandon not the significance of training “the eye”, since it is such a rare skill in building on your own startups. That very skill is applicable to the market that your business is trying to get a piece of. Demographics and cultural aspects could be a defining factor in the success of your new start-up. In a university setting, you would be taught on how to be critical how to see beyond what lies in front of you. Through other entrepreneur’s stories you could learn how to spot a business opportunity and how to predict the future prospect of a particular business. Having access to open up discussion and share between like-minded individuals is quite important if you would like to expand relations and grow your network. Many universities in Indonesia nowadays focuses their education on entrepreneurship, either by opening a special undergraduate program of Entrepreneurship or by incorporating entrepreneurship courses to mandatory classes that undergraduate students must take in their first year. Many successful entrepreneurs are invited to lecture so they can teach their method and share experience in their journey. Higher education providers observed the reality on the ground that the demand for human capital from industries are decreasing steadily, therefore they should aim to produce university graduates that could open up new businesses and opportunities. There is, for example a university in Jakarta that uses the word “entrepreneur” in their university brand name to emphasize their commitment towards entrepreneurship. Many universities that operates in Indonesia these days, have their own entrepreneurship center which provides students with entrepreneurship courses and training, and more than often they also help funding new startups. Technology based entrepreneurship is definitely starting to catch up these days. Many new businesses are created everday week that was started by the founder’s technological skill and knowledge. TechinAsia on May 31, 2015 issued an article highlighting 10 most influential technopreneur under 30 years of age, and 3 of them are Indonesian. All of these technopreneurs started an online platform that made a great impact to the market. Each of them has a software engineering background and they make use of their skills and knowledge to the maximum. If only they did not study in a university level, they would not have the capability to innovate and start their own businesses at all. We could take the early history of Apple computers which was started by Steve Jobs and Steve Wozniak, for instance. Jobs being the visionary and Wozniak being the master programmer. It is really unfortunate really that Jobs got all the credit while it was all Wozniak’s work that revolutionize our computer culture from the beginning. The technopreneurs in the world today, are the perfect mix of the two great minds, being both great engineer and visionary. Ultimately, it is up to you to decide. 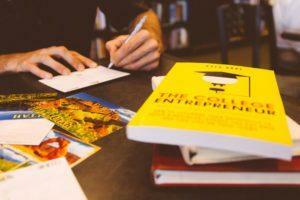 There exists a couple of ways on how to get into the world of entrepreneurship. A certain path for one individual, could be a path to failure in your situation. It is up to you to comprehend which path would be the best suitable path for your own growth. After all, decision-making skill is a crucial skill for entrepreneurs. Author: Pierre Yohanes Lubis is an Indonesian product designer. Having finished his master’s from Germany and worked in the area of automotive interactive design in Frankfurt, he returned to Bali to work in the field of sustainable product design and strives to promote design-based entrepreneurship.